Northern Ireland’s Police Service has initiated steps to demand from Boston College the remainder of the 46 confidential oral histories conducted with members of the IRA and loyalist militias involved in the decades long war as part of the school’s Belfast Project. 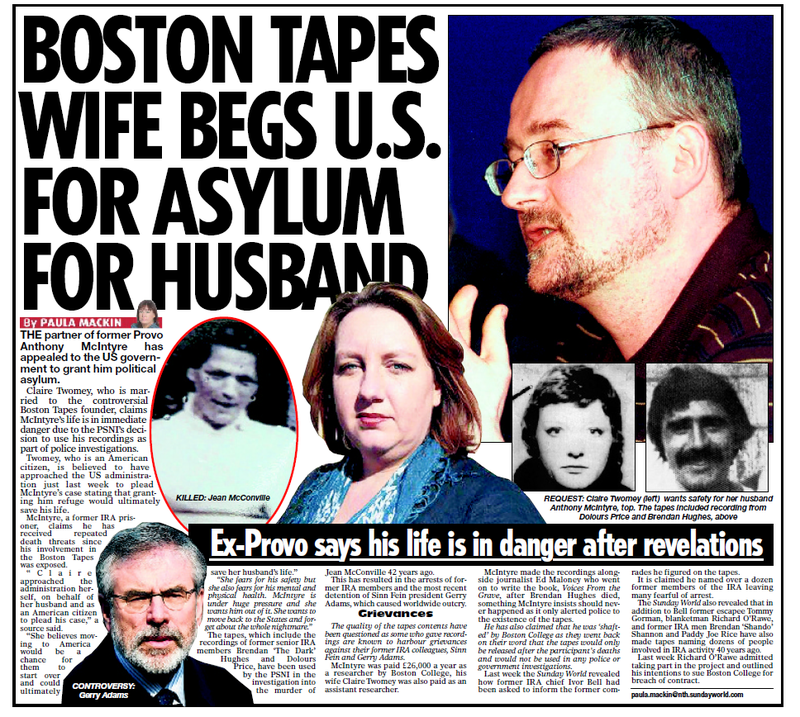 In meantime, an article that appeared in Ireland’s Sunday World online news edition claims that Anthony McIntyre — who was the main researcher of the Oral History project at Boston College- and his wife US citizen Carrie Twomey are now seeking political asylum –- Carrie Twomey denies any of this and claims that somebody was listening in to her telephone conversations with the US Embassy in Ireland. Adrian Flannelly (AF) interviews Carrie Twomey (CT) via telephone from Ireland about allegations made in a recent Irish tabloid about her and her husband Anthony McIntyre, the lead researcher for the Boston College tapes. AF: We’re going to go to Ireland and we will catch up with Carrie Twomey who is the wife of Anthony McIntyre. Anthony McIntyre was indeed the – correct me if I’m wrong here – first of all Good Morning, to you. Well, it’s Good Morning in New York and Good Afternoon to you, Carrie. CT: Good Morning. Good Morning. And Good Afternoon. And thank you for having me today. AF: I just want to check a few things with you. Your husband, Anthony McIntyre, was hired by Boston College to conduct interviews for the Boston College oral archive. CT: Yes. 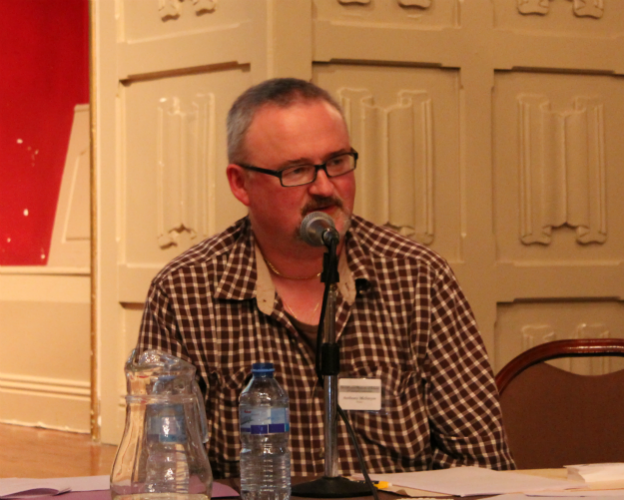 Boston College contracted Ed Moloney as project director for what they called The Belfast Project which was meant to be an oral history archive of people that were involved in The Troubles. It was based on the idea of the Bureau of Military History where they had also done archived interviews and recorded the history of what went on. And Anthony was hired to conduct the interviews. Which he did. He conducted interviews – many hours of interviews with twenty-six people. He was hired because first of all he has his PhD. His PhD is in the history of the Provisional IRA and the formation of it and he is academically trained. And he is also a former IRA Volunteer who did eighteen years in Long Kesh. He was there during the blanket protest – he was four years on the blanket and no-wash protest and he was there during the hunger strikes. And he would have the experience and the knowledge and the training to conduct an oral history very much in the vein of what we now see being published in the third volume of Ernie O’Malley’s oral history of the IRA from the 20’s and whatnot. It’s an honoured tradition that he’s following in. AF: A story, maybe even two stories carried by The Sunday World tabloid, which is a very popular paper in Ireland, in the northern edition they have carried some allegations which you don’t agree with including the fact – well, you can tell us the fact – but the amount of money paid to Anthony and then an add-on to that that you were being paid as his assistant. Can you straighten that out for us? CT: Yes. There have been a number of allegations floating both in cyberspace and commentary and specifically published in The Sunday World tabloid about Anthony’s role in the project. And our safety is very much at risk – graffiti is sprayed up and down on the walls of the Falls Road: “Boston College Touts” – “In-Former Republicans” and so there’s an issue being made of how much money Anthony made or was paid or was paid to conduct these interviews which amount to twenty-five grand a year. AF: That’s twenty-five thousand pounds? CT: Yeah. That’s not a lot of money. He did not make any money from the book because he had nothing to do with the book – he was not involved in it. He did not make any money from the documentary because he was again not involved in it. I was never hired nor worked on the Boston project as is being alleged. Number One: I understood at the time that the project was being conducted the issue of how sensitive the material was and it was in my own interest, safety-wise, to have nothing to do with it – to not know anything about it. And Number Two: There was never a position there anyway! I never worked on the Boston project. I became involved in the campaign to stop the subpoenas but that’s not a paid position. I’m not hired by anybody. I’m doing this because I love my husband and I want to protect my family. It’s just a lot of scary stuff happening and The Sunday World – they carried an article labeling Mr. Ivor Bell an informer, a “tout”. He’s a seventy-seven year old man that’s charged with aiding and abetting and he’s the only person who has been charged in relation to the Boston tapes being subpoenaed…well, the McConville case I should say. And the article discussed the anger that’s felt and the graffiti and named a bunch a people and named people that weren’t even involved in the Boston project and made the allegations of Anthony having tonnes of money and myself also being employed. All rubbish. All wrong. And all very worrying because it obviously stokes up the hate campaign that’s being directed against the people that participated in the project. AF: Now okay….just wait. There’s one thing I want to straighten out now: you’re American. You have two children who are American citizens. So the conversation in the area that I would like to address is what appears to be and obviously it’s not so that you were looking for asylum for your husband, Anthony, in the United States. Because that’s the thrust of the story in The Sunday World. CT: Yes. And I have never made a visa application and never discussed asylum with the embassy in the main because the embassy, in my communications with the State Department, have made it explicitly clear that Anthony will never be allowed in the US. AF: Just tell us why. Just tell us why that is so. CT: Because he has the conviction for an IRA murder so in the eyes of the government he was a terrorist. And post 9/11 especially – he’s just not allowed to come in. I’ve known this for years so this is not anything new. And I have been very upfront – I even think that we may have discussed it in the previous interviews that we’ve done – that I have been in contact with the embassy and the consulate raising the issue trying to get the subpoenas stopped because of the safety issue so that’s never been any secret. But the claim that I am begging for asylum? No. No. I know that asylum is not going to happen. It’s not on the table. What I am begging for is for the US government to stop facilitating this British grab and criminalisation of Irish history because of the danger it poses to our family. AF: The American Embassy in Dublin or in Belfast? CT: The American Embassy in Dublin – Yes – for which we still do not have an Ambassador. And I was very angry because I just think that this is a situation that has – three years we have spent pointing out exactly where this is going. And for three years we have wanted an adult to step forward and stop the train wreck and everybody’s passed the buck – nothing’s been done and [they’ve all] allowed this to continue. I don’t want my family or the participants in this project to be the collateral damage for the United States protecting the assets of the British. I am livid over that. So I had this conversation and I followed it up with an email that documented the contents of the conversation with the embassy. The conversation was on Wednesday. The email was on Thursday. Or there’s been a serious breech of protocol and illegal privacy violations. And I have asked the State Department for a formal investigation into the matter. I have also lodged a complaint with the Garda because this is a very serious issue. If it’s not my phone and my email or my family being monitored this is the US government’s communications that are compromised. And I think that the Irish government should take this very seriously whatever way this works out. This needs to be investigated. How does this end up in The Sunday World? Because I didn’t call The Sunday World and The Sunday World certainly did not and still have yet to call me. AF: You’ve have no communication with them, directly or indirectly. AF: You have had no communication with The Sunday World at all. Have they tried to talk to you? CT: No. No, they have not. Since they’ve been running these stories they have not. Now I know a fella that writes for The Sunday World and I have spoken to him, actually I just emailed him, asking for a copy of the article and that’s the only contact that I have had and that was after this. But in terms of the reporter writing the story, the editor, anybody involved in the publication of the story? No. I have not had any contact with The Sunday World whatsoever. AF: Do you agree, Carrie, do you agree that it was probably, that had it not been for the arrest of Gerry Adams in the lead-up to the elections, that there wouldn’t be a story here at all? CT: Oh, I think that the arrest of Adams has definitely contributed to the atmosphere and the interest and the threat that we are living under right now – yes. And I think that that’s why these malicious stories and untrue stories are being peddled around because of the arrest of Adams in particular. I mean, you and I sat down how many years ago on this issue basically outlining where it would go if it wasn’t stopped? And here we are where we knew where it would end up if it wasn’t stopped. This is I think is the greatest act of British vandalisation of Irish history in recent times and they’re criminalising Irish history and I think that’s objectionable and we should be stopping it. We have the right to tell our history – whatever perspective you’re coming from – and it should not be criminalised. How much and how little has changed. AF: Carrie Twomey, my guest, is the wife of Anthony McIntyre, who conducted the interviews. There are a couple of things that I’d like to sort out. AF: Okay, well…I guess you’re answering the question there. CT: That’s the first that I’ve heard that! CT: Yeah…that’s not true. He was paid by Boston College. And if fact, anybody who has an academic contract will recognise this: Every few months when the funding runs out and you’re coming to the end of the contract and you’re like oh! what are we going to do and you’re counting your pennies and then the funding always comes through on the last day and then you’re good for another six months – I mean – that was all Boston College and pretty ridiculous to think otherwise. AF: Okay. Now was there another source of income for your family? You do have two children and you do live in Ireland and have lived in Ireland. Was the payment from Boston College – was that pretty much the source of revenue for your household? CT: Yes. We lived in Belfast at the time. My children were much younger then – in fact I think I only had one child at the start of the project. And I was (and still am) a housewife. One of the benefits that I found as an American living in Ireland was that I could stay home with my children. The cost of childcare – were I to be working as well as Anthony be working – I would have been paying to work basically because as many working mothers know – it’s extremely difficult for enough child care to cover your ability to freely work. So we made the decision that I would be a full-time mom and stay at home. Also the nature of the project itself and the hours that Anthony would be working were not a set kind of thing. It wasn’t like I knew he would be from nine to five and then I could take an evening job and he could mind the kid. It wouldn’t work like that. He could be gone at any time and he could be gone overnight at any time. So I had to be the dedicated homebody and minding the child. Which I did and nobody paid me for that. I think we may have gotten child benefits which, if I remember correctly but I would honestly have to check, it would have been maybe eleven quid a week or something – not a lot of money and Anthony was the sole breadwinner…. AF: …Just to put that in perspective: if that was eleven quid as you say a week that amounts to what? About fifteen dollars? CT: I don’t know and I wouldn’t stand over the amount of it but it wasn’t a huge amount of child benefits, I mean it was…. AF: …And that you were entitled to regardless, right? CT: Yes. I’m entitled to child benefit down here and that amounts to I think two hundred and sixty a month for the two children. And that’s my income so…not a lot of money. AF: Carrie, I do want to ask you a little bit about yourself. Where did you grow up? CT: I grew up in southern California. AF: And when did you meet Anthony? CT: I had read a number of articles and letters that he had written in the Andersonstown News online and I had sent him an email because I appreciated his politics. It was a long email – you know – “keep your chin up” because I could see he was pushing a very hard road and an isolated road. AF: You were a pen pal were you! Were you a pen pal? CT: It was a very short period. Because I sent him this thing thinking: If someone in Los Angeles is thinking that you’re right then you can’t be all that wrong – because I understood the principles that he was talking about. He didn’t read the email! (laughs) Because it was too long! CT: So then they had started the Irish Republican Writers Group and made a website and there was an email link on the website that didn’t work. And I emailed him again and said: By the way, did you know that this link doesn’t work and if you need any help with your website let me know. Because that email was just two lines he replied. And we started chit-chatting just on the politics of things. At that point I knew that I wanted to come to Ireland. I never wanted to do the two week tour as I had such an interest in Irish history and recent Irish history that I knew I needed to either come to Ireland and understand it on a day-to-day level or just get a new hobby and move on in California. My work situation opened up where I had the opportunity and I thought I don’t want to be sixty years old and wondering “what if”. So I packed my life into six suitcases and I had a friend in Drogheda (who is Godmother to my daughter) and she said: I have a spare room. And I came over. And this was at the time when immigration was much more lax and I thought: Okay. I have three months and if I like it I’ll do what I can to secure legal status and if I don’t I’ll come home and continue on in my career. I was a union organiser at the time. AF: When did you meet Ed Moloney then who is the, hired separately we have to assume – correct me on anything I’m saying – but he was hired separately as director of the Boston College oral project pertaining to the history of The Troubles. So when did you meet with Ed Moloney? CT: I would have met him…I remember distinctly the evening that Anthony and I had dinner in his home but I can’t remember exactly when it was – but it would have been sometime before the project began I would think. Because he and Anthony had been friends and had known each other for some time. I arrived in 2000 and the project started in 2001. So I would have met him sometime in the Summer but I didn’t have a lot of contact with him. He was a journalist and he was somebody that Anthony knew and that knew Anthony and they had a friendship. AF: Carrie, what about the rumours that say that from the get-go that Ed Moloney and your husband, Anthony McIntyre, had agreed to derive income a book based on the tapes? AF: That’s why I’m talking to you. CT: My husband made no money from any book. And in fact the one book that my husband did do, his own book, which was a compilation of essays that he had written for our website, The Blanket, and it was picked up by a small publisher based in New York, Ausubo Press, he was paid an advance of five hundred US dollars which amounted to two hundred and fifty sterling for that book. And we recently got our first royalty check because the advance had finally been paid off with the sales – and our first royalty check was five dollars. That’s the money that my husband has made from books. There was no, at least from our perspective, there was no desire to do any book at the start of the project because the whole point of the project was to be confidential. The archive was there to be for the future and the whole thing was the confidentiality and the protection and the secrecy of doing this because of the dangers it posed doing. And we can see those dangers evident today in how many people are outraged that this project was even done. I am strongly of the opinion that the more history the better – the better we understand history – that we should not be restricted to one viewpoint only of what has occurred. And everybody has the right to tell their history. So I was very supportive of Anthony doing this. But it was never about books or money or what could be earned from it. It was about the ability to put voices to the record and that was what was important to my husband. AF: Now of the interviews which your husband, Anthony McIntyre, conducted to what degree – we’re talking about were most or all of those interviews strictly with the Nationalists – those who were involved in the IRA – or were there others? CT: The archive itself was meant to expand as it went along. AF: …Was there any communication, for instance, with Anthony and the other interviewer? CT: There would be in terms of organisational communications i.e. : here’s Tom Hachey and Bob O’Neill coming over to Ireland – everybody needs to meet and discuss the project. Not in terms of: discuss the contents of the interviews or who was being interviewed. But in terms of: where’s the funding at, are the contracts being renewed, how’s the procedure for the transport of the archive. You know, organisational matters. But Anthony would have no idea and nothing to do with what Wilson’s work was and Wilson likewise would have had no idea or nothing to do with what Anthony was doing. And I also want to point out in terms of the confidentiality of the project and how paramount it was and how much it was believed at the time of the project that the confidentiality guarantee was there is that my husband was one of the people who himself was interviewed. Now he didn’t interview himself – he was interviewed by an academic. But he would not expose anybody that he was asking to also participate in the archive to any risks that he himself did not expose himself to. So he also contributed his history and his oral history archive to the archive. That really I think says it all in terms of what the belief at the start of this project was. AF: Carrie, we’re running out of time. I want to thank you for joining us this morning and indeed straightening out some of the confusing reports that we get. CT: I appreciate your having me and I am always willing to speak to anybody. If The Irish Voice or The Irish Echo, I’ve spoken with Ray before, if anybody has any questions on anything I am more than happy to clarify. We don’t have to agree on any of the politics but the facts are easy to ascertain and I’m quite happy to help and assist in any way that I can. CT: …Sorry, I don’t mean to go on but we’re available (to check facts). AF: Very good. Okay. We’ve got to leave it at that, Carrie Twomey, thank you for joining us on Irish Radio Network USA. And friends you are listening to Irish Radio Network and our guest there, Carrie Twomey. The wife of an ex-IRA prisoner who was the key researcher involved with the controversial Boston College archive tapes has complained to the Irish police that her phone and email communications are being spied on. Carrie Twomey told the Guardian on Friday night she wants the Garda Síochána to investigate her claims that her family are being subjected to electronic surveillance. Her husband Anthony McIntyre recorded and collated the recorded testimonies of dozens of former IRA activists, some of whom have claimed on tape that Gerry Adams ordered the death and secret disappearance of mother of ten Jean McConville in 1972. The Sinn Féin president has always denied any involvement in the kidnapping, killing and covert burial of the widow, who the IRA accused of being a British Army informer. Since Adams was arrested earlier this month and questioned for four days by detectives about the McConville murder, McIntyre and the founder of the Boston College-Belfast Project, Ed Moloney, have come under sustained verbal attacks. Sinn Féin councillors and their supporters have labelled them “Boston College Touts” – a euphemism for informers. Twomey said she was certain that her phone calls and emails had been subject to “illegal privacy violations” in recent weeks. The blogger and writer said a recent communication between herself and the US embassy in Dublin had been compromised and its contents leaked to a Sunday newspaper in Belfast. She added that the alleged surveillance was linked to the recent announcement that the Police Service of Northern Ireland wanted to seize all of the Boston College-Belfast Project tapes, even those not related to the McConville murder, which the police currently hold in Belfast. Ed Moloney has urged the US government to resist police demands that all of the remaining tapes detailing paramilitary testimonies be sent to Belfast. Participants in the Belfast Project, both former IRA members and ex loyalist paramilitaries, are currently involved in legal action to take back their tapes. Many of the loyalists want the material destroyed fearing future arrests over past Troubles-related crimes. All of those who took part agreed to do so on the condition that the tapes would not be released until they were dead. If the PSNI seizes all of the Boston College archive material it could lead to dozens of veteran IRA and loyalist paramilitaries being arrested. Twomey said: “These claims now circulating are a direct result of a phone conversation I had with the embassy on Wednesday 14 May, 2014 and subsequent email correspondence sent Thursday 15 May, 2014, in which I highlighted the heightened risk to our safety and the safety of the participants in the project as a result of Sinn Féin’s orchestration. “That contents/aspects of our communication, however inaccurately spun, appeared days later in a Sunday tabloid is a matter of serious concern, not least because of the privacy violations and increased risk it indicates. Neither myself on his behalf nor Anthony have requested asylum. I have never worked for Boston College and did not do any work, paid or unpaid, on the Belfast Project. However, I have been in contact with the US Consulate in Belfast and the Embassy in Dublin since the start of this nightmare asking for help and have maintained contact throughout. I have never made a secret of this, and have referred to it in numerous interviews. It has been made clear to me throughout my dialogue with the State Department, in no uncertain terms, that Anthony is not ever going to be allowed into the US. These claims now circulating are a direct result of a phone conversation I had with the Embassy on Wednesday 14 May, 2014 and subsequent email correspondence sent Thursday 15 May, 2014 in which I highlighted the heightened risk to our safety and the safety of the participants in the project as a result of Sinn Fein’s orchestration. That contents/aspects of our communication, however inaccurately spun, appeared days later in a Sunday tabloid is a matter of serious concern, not least because of the privacy violations and increased risk it indicates. I have requested from the State Department a formal investigation into how information that I had raised our safety with the Embassy last week ended up in the papers. Either our phone/email is compromised, or the Embassy’s communications are, and/or there has been a serious breach of protocol and illegal privacy violations have occurred. I have also filed a complaint with the Garda and requested an investigation from them into the matter. “Can you also please advise on the status of the requested investigation into the Sunday World article based on our communications of last week? The fact that contents of a phone conversation and email correspondence between ourselves that took place on Wednesday and Thursday appeared to have been published in the Sunday World tabloid is alarming and may mean that Embassy correspondence has been compromised, whether by unauthorized electronic access to my phone and email or monitoring of U.S. governmental communications. In the alternative, it means that communications between U.S. citizens have been monitored by agencies in the U.K. If this information was not obtained via electronic means then there is a leak which indicates at the least extremely serious and illegal privacy violations and/or breach of protocol. Neither of these scenarios are appealing but must be addressed immediately. As I have not had any response to my previous email requesting an investigation, I am again repeating my request for a formal investigation and would like to know what steps will be taken. “Thank you again for taking the time to speak with me yesterday afternoon. I believe I have made my position clear. I understand that our children and I can go to America at any time but that in doing so we must abandon their father to his fate. [The Consul General] was also unequivocal on our options. Given Anthony’s conviction, he will not be allowed into the United States. As we discussed yesterday this was conveyed to me when we first spoke a year ago. You outlined the difficulties any visa application would encounter due to his status and spoke of the best possibility being what you referred to as a remote long shot of a ‘golden ticket’. This was the conversation where you also suggested Boston College would be the ideal place to employ Anthony, which eloquently demonstrated to me the level of interest and seriousness this issue was being treated with: none. It was not being taken seriously at any level and its ramifications obviously not understood and glibly dismissed. In other words, Anthony was not going to be allowed entry. In subsequent meetings and conversations with yourself and [the CG] this was consistently and clearly conveyed, including during yesterday’s conversation. In my last meeting with [the CG] and in yesterday’s phone conversation with you my options are either to break up my family or wait until either Anthony is killed or the children are harmed before the US State Department can and/or will do anything. Neither yourself nor [the CG] contradicted or denied that view when it was put to either of you. In addition to my own family’s safety, as I have explained, all those who have participated in the Boston College oral history project are at risk. I noted to you yesterday that people who had nothing to do with the project are being put at risk due to the vicious hate campaign being orchestrated and conducted by Sinn Fein. Ivor Bell, the only person charged as a result of the seizure of the archives — the 77 year old man charged with aiding and abetting based on the tapes of “Z” — is being referred to as the “Boston Tout” as you will have seen on the Sunday World front page previously sent to you. Mr Adams will not want the trial of Mr Bell to go forward given what would be revealed in court should the tapes of “Z” be aired. Bell, who lives in West Belfast, is at great risk of serious harm. I will reiterate that none of this should be happening. Whoever made the decision to facilitate the MLAT subpoena request has not only put my family at risk but has also destabilized the security of the situation in Northern Ireland. It was not a matter of being forced to comply with legal obligations, as the MLAT is not de facto automatic (and no nation would give up its own sovereignty and interests so easily). Scope is provided to seek consultation and refuse cooperation based upon established foreign policy and the likelihood of successful prosecution arising. In the case of the subpoenas of the Boston College archive, neither threshold is met. The agreement of the US-UK extradition treaty specifically states that persons wanted for pre 1998 crimes in Northern Ireland will not be sought. This is due to America’s established foreign policy of supporting and facilitating the peace process which has been the policy under numerous Presidents. So it is ridiculous that no person can be extradited but archival material apparently can be. Someone should have been asking questions and clearly they dropped a massive ball. In addition, it is astounding that the British even need the Boston archives in the first place. They are utterly useless in court beyond hearsay. Gerry Adams’s driver, Roy McShane, was working for the British for years. The Chief of Staff of Sinn Fein, Denis Donaldson, was also working for the British for decades. The head of the IRA’s internal security, Freddie Scappaticci, was a British agent, as were many other people. The PSNI do not need the Boston College oral history archives to prosecute anyone and it is ludicrous that the only evidence they produced upon arresting Adams was the archives, books, and newspaper articles. That alone makes a mockery of the whole ‘legal obligation’ chimera of the disastrous decision to issue the subpoenas. I am not going to let my family become collateral damage for whatever idiotic decisions are being made by people who should know better. I have spent 3 years now begging you people to stop this train wreck and all that’s been done is taking my warnings to protect the assets of the British. I am beyond angry. The oral history was bravely done in good faith and should have been a testament to the benefits of the peace process and foreign policy success of the United State’s investment in supporting and nurturing it. Its confidentiality should have been protected. Instead the lives of all those who participated in it are at risk, and my family, my children, are on the line. You and I will both be lighting candles for very different reasons and praying that no lives are lost or ruined as a result. 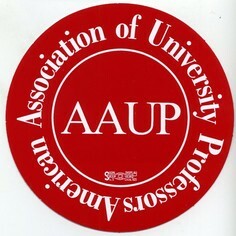 The State Department and the Department of Justice better be praying that their incompetence does not result in the needless sacrifice of American lives abroad or harm coming to anyone who participated in an American university’s noble project. I am just praying this nightmare ends with everyone intact. Reproduced on Irish Central, 23 May, “Political asylum move by BC tapes researcher Anthony McIntyre”, by James O’Shea. Neither Paula Mackin, James O’Shea nor anyone from the Sunday World and Irish Central contacted us prior to their publication of the inaccurate Sunday World piece. The Irish Central piece went out over the wires and was replicated across the web. Neither of the reporters nor the papers involved have attempted to contact us either pre or post publication. The wife of former Boston College researcher, Anthony McIntyre, has made a formal complaint to authorities that her communications are being monitored. Carrie McIntyre, the wife of Anthony McIntyre, made the complaint to Irish police and the US State Department. Her husband was the lead researcher on Boston College’s Belfast Project. The project features dozens of interviews with paramilitaries, who spoke candidly about their involvement in The Troubles. The understanding of both the researchers and the interviewees was that their participation would remain secret until after their deaths. Mrs McIntyre, also known as Carrie Twomey, has been heavily involved in the campaign to restrict access to the project. On Thursday, the Police Service of Northern Ireland (PSNI) confirmed they are seeking to obtain all material relating to the Belfast Project. Last year, the PSNI used a treaty between the UK and the US to obtain some of the interviews. 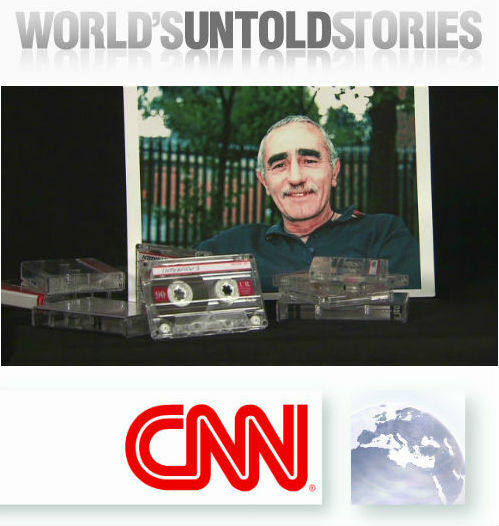 Tapes from seven interviewees were handed over, all of which were deemed to have relevance to the murder of Jean McConville in 1972. The widowed mother-of-10 was abducted, murdered and secretly buried by the IRA. The released recordings have led to a number of arrests, including that of the Sinn Féin president Gerry Adams. Dr Anthony McIntyre conducted the interviews with former IRA members. Since his involvement was revealed, his family has been informed of a threat to their safety. His wife and children are US citizens, but the family is adamant that contrary to some reports, they have not sought asylum in America. Anthony McIntyre cannot travel to the United States in any case, as he is a former republican prisoner. He insists that even if he were allowed into America, he would refuse to leave the interviewees who spoke to him about their time in the IRA. His wife believes that there has been illegal privacy violations and surveillance of conversations she has had with regard to the family’s safety. Separately, Boston College has offered to return the remaining testimony it holds to the interviewees. A spokesperson would not be drawn on whether any of those who took part in the project had availed of the offer, but the BBC understands that approaches have been made to have some tapes repatriated. Boston College will contest a new legal bid by British law enforcement to seize the entire trove of interviews from the university’s Belfast Project, university officials said Friday, joining a renewed battle over the controversial archive. In a statement Thursday, the Police Service of Northern Ireland said it would seek to obtain the collection of interviews with former members of militia groups that clashed during the decades-long conflict known in Northern Ireland as the Troubles. But police did not specify a course of action or timetable. A spokesman for Boston College said Friday that the university had not received any information about the move to acquire the archives. But the spokesman said the blanket request for all materials, including interviews with more than a dozen members of a militia group loyal to Britain, seemed aimed at rebutting critics who have accused British authorities of using the archives for political purposes. A spokesman for the Police Service declined to comment. From 2001 to 2006, researchers interviewed former members of the Irish Republican Army, who sought a united Ireland, and former members of the Ulster Volunteer Force, a paramilitary group that wanted Northern Ireland to remain part of the United Kingdom. Dunn said Boston College would fight to protect the interviews and hoped that US authorities would reject the legal request. 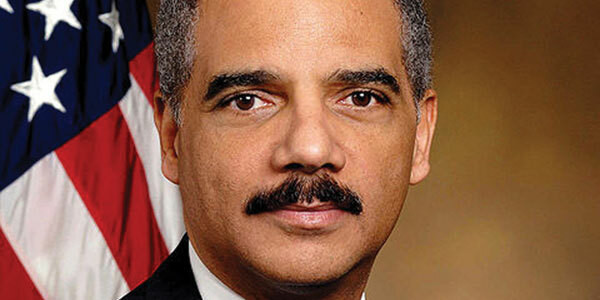 A spokeswoman for the US attorney’s office in Massachusetts declined to comment. Former militia members consented to interviews for the oral history project with the assurance that their statements would be kept confidential until their death. But Northern Ireland authorities, using a mutual legal assistance treaty with the United States, pursued the interviews as potential evidence of past crimes. The treaty requires the nations to share information that could aid in criminal investigations. After a lengthy court battle, Boston College was compelled to hand over 11 interviews with former members of the Irish Republican Army, leading to the recent arrest of Gerry Adams, the leader of Sinn Fein, in connection with the notorious 1972 killing of Jean McConville. After being released without charges earlier this month, Adams said interviews from the oral history project formed the basis for his arrest. Adams has denied any involvement in the killing of McConville, a mother of 10 who the IRA believed was an informer. McConville was abducted and secretly buried. Years later, the IRA admitted responsibility for her death. Information from the interviews also led to the arrest of Ivor Bell, a former IRA member who was charged in the slaying of McConville. The arrests have led to criticism that Northern Irish authorities are exploiting the archives to cause political damage to Adams and Sinn Fein, the former political arm of the Irish Republican Army. Adams has criticized researchers for focusing on former IRA members who became critics of Adams and the peace process. After Adams’s arrest, Boston College said it would return interviews to any participants who requested them and would not keep copies. Several people had already made requests. Ed Moloney, an Irish journalist who led the project, blasted the British authorities’ latest bid to obtain the archives. “I call upon the US government to resist this fishing expedition by the PSNI and to remember that the major consequence of this bid to invade an American college’s private archive will be to undermine a peace deal that was in no small way the product of careful American diplomacy and peace building,” he wrote on his blog. “I also call upon Boston College to vigorously resist this action and to rally the rest of American academe in the cause of research confidentiality,” he wrote. Sarah Wunsch — staff attorney at the American Civil Liberties Union of Massachusetts, which backed two project researchers in their effort to protect the interviews — called on American authorities to reject the police request. “I think it’s time for the US government to call a halt to this, which is not only damaging to oral history and academic freedom, but also immensely damaging to peace in Northern Ireland,” she said. The attempt by NBC News to plunder the Boston College oral history archive is nothing short of reprehensible journalistic pirating. I first learned of it when roused from my sleep around 4 am this morning by my wife who had been alerted by a friend to the story when Ed Moloney ran it as breaking news on his blog, The Broken Elbow. She and I were both outraged by it. The “breaking news” on Ed Moloney’s site was a letter from NBC News asking U.S. Federal Judge William Young to turn over the Belfast Project transcripts to them. In its action, the network is attempting to make a flawed public interest claim in an attempt gain access to the confidential materials and sources at the heart of the Belfast Project. After a prolonged battle in American courts buttressed by a legal fight in a British courtroom we might be forgiven for imagining that journalists and media outlets would be more sensitive than usual to the need for source protection in light of the sustained assault on the Boston College Archive by British political policing agencies. There are two kinds of issues when it comes to the public interest. There is the public’s right to know what their government is doing in their name and there is the right of journalists to protect their confidential sources so that the public can be better informed. If there is not source protection, there will be no sources and important stories will evaporate. It is a balancing act that every reputable journalist respects and adheres to. NBC’s legal action comes at a time when there is an organized Sinn Fein hate campaign underway against those it accuses of having been involved in the Boston College project. This campaign has threatened the safety of participants, the lead researchers and individuals that had no involvement whatsoever in the project. It is a long standing tradition and obligation of all journalists to protect sources of confidential information from all harm that might accrue to them*. NBC is clearly unconcerned with the fate of the people involved in the Belfast Project. The Boston College Archive story has been going on for three years, and yet it is only now, in the wake of Gerry Adams’ arrest, that NBC has shown much interest in the case. Instead of spending time and resources on the story, they have simply gone to court to get at sources and material in an attempt to make headlines during Gerry Adam’s upcoming visit to the United States. At minimum, it is lazy journalism. What is egregious is that they are attempting to set a very dangerous legal precedent. Their request has been submitted to Judge Young, the same judge that a U.S. Appellate Court slapped down when Judge Young tried to hand over parts of the Boston College archive that wasn’t even responsive to the subpoenas. If NBC is successful in their request, they may find down the road that they will bear responsibility for piercing a bigger hole in source protection laws which are already under assault by governments on both sides of the Atlantic. If NBC News wants to investigate Sinn Fein leadership or anyone else it should send out its own journalists to do the hard work instead of jeopardizing journalistic standards and practices or risking the lives of sources they know nothing about. The American news network, NBC, has made a formal request to have transcripts from Boston College’s Belfast Project released. Its news investigations team made the application to a US Judge, William Young, who is one of the few people to have read the entire archive. Information from the recordings has led to a series of arrests, including that of Sinn Féin president Gerry Adams. The project was designed as an oral history of the Troubles. Dozens of former paramilitaries from the IRA and the Ulster Volunteer Force gave candid interviews to researchers employed by the university, on the understanding that their involvement would not be made public until after their deaths. The course director, journalist Ed Moloney, published a book based on two of the accounts given to the project, after the interviewees had died. However, the PSNI became aware of the existence of the tapes. They used a treaty between Britain and the United States to obtain any material that could help their investigation into the murder of Jean McConville in 1972. Mrs McConville is the best known of The Disappeared, a group of people abducted, murdered and secretly buried by republicans. The researchers fought the release of the interviews through the US courts, maintaining that it would represent a breach of contract and trust, and violate the ethical code on the protection of sources. Judge Young, who read the archive in order to determine which testimonies made reference to Mrs McConville, acceded to the PSNI request. He did, however, describe the project as “a bone fide academic exercise of considerable merit”. Dr Anthony McIntyre, who conducted the interviews with former IRA members, said he was shocked to learn that a news organisation had attempted to have the documents released. Mr McIntyre has been made aware of threats to his life as a result of his involvement in the project. He said he could not understand how a news organisation could be prepared to violate the code on the protection of sources. 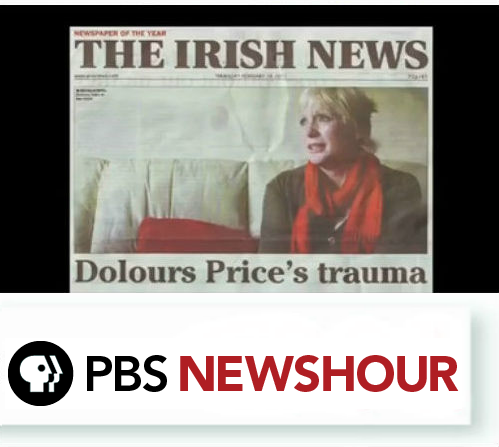 Thebrokenelbow.com has learned in the last few minutes that NBC News has written to Judge William Young of the Boston Federal District Court asking that the court unseal all transcripts, audio recordings and documents handed over to the PSNI on foot of the subpoenas served on Boston College. NBC wrote to Judge Young on May 6th, two weeks ago and the letter was sent by Thomas J Winter of NBC News Investigations. It is not known what response Judge Young has made, if any. Arguing that American citizens have the right under a Supreme Court judgement in 1978 to gain access to judicial documents, NBC also maintains that: “This case or any case involving incidents of terrorism and criminality committed by several and various parties representing diverse ideologies both political and religious is a matter of great public interest”. NBC News told Judge Young it wanted the documents released “as soon as possible”. Judge Young presided over the hearing in December 2011 and January 2012 which overruled Boston College’s attempt to quash the PSNI subpoena and he later personally determined which of the interviews should be handed over, a decision he took when Boston College’s lawyers claimed college staff had never read the interviews and could not help. NBC News respectfully writes to request that the Court unseal any and all transcripts, audio recordings, and/or documents related to a subpoena served to the Trustees of Boston College by the United States of America and referred to in the above noted case. The knowledge of a subpoena served by the U.S. Attorney regarding an oral history project by Boston College has been made public through published work(s) by the school. This Court has entertained legal proceedings regarding the production of records created by Boston College and their eventual transfer to foreign government(s). As the Court is aware, the public and the press have a presumptive right of access to court records. In Nixon v. Warner Cable, the Supreme Court recognized an historic common law right of access to judicial documents. 435 U.S. 589, 597 (1978). “The common law right of access is not limited to evidence, but rather encompasses all ‘judicial records and documents. '” Quoting Chief Justice Burger in Richmond Newspapers, “To work effectively, it is important that society’s criminal process ‘satisfy the appearance of justice,’ and the appearance of justice can best be provided by allowing people to observe it.” Id. at 821 (quoting Richmond Newspapers, Inc. v. Virginia, 448 U.S. 555 (1980). This case or any case involving incidents of terrorism and criminality committed by several and various parties representing diverse ideologies both political and religious is a matter of great public interest. These parties may also at this time or in the past have had direct official contact with the government of the United States of America. openness provides on the judiciary as a restraint against possible abuse of power; and helps to ensure the propriety and appearance of propriety in judicial proceedings. Particularly of interest in this case is propriety and appearance of propriety in judicial proceedings involving the United States of America and foreign government(s). We understand there are times that other concerns may outweigh the strong presumption of access. But we believe the Court should put the burden on the parties, including the Court itself, as to why documents should remain sealed in this important case — not the members of the press seeking access. If there is a specific finding to continue to keep some materials sealed, we request the Court keep such sealing limited in scope with perhaps limited redactions instead of sealing the records in their entirety. NBC News also requests the Court provide particularized findings if the materials are to be remained sealed and as a result remain hidden from public view at this time. We believe these materials should be made public as soon as possible. We request they be put in the public court file at no expense to the public since the public could not attend the initial hearing in question due to the Court’s sealing order. Should the Court have any questions or require further information, please feel free to contact me by phone at 212 413-6446. Your time and consideration in this matter is greatly appreciated. Sinn Féin can huff and puff all they like and claim the arrest of party leader Gerry Adams was brought about by a small cabal of British police officers who are determined to “settle old scores,” but it will not make it so. No matter what David Cameron might say, having invested so much time and money in the Peace Process there is absolutely no way Mr Adams would be arrested by the PSNI without it first being green lighted by the British government. Mr Adams was arrested because it suited David Cameron and the British security services. Never forget it was the English ruling class who stole the Pashtun proverb and made it their own. For the public school and Oxbridge educated upper middle class louts, who once again control the British State, revenge is indeed a dish best served cold. There was something surreal about Gerry Adams behavior on his release. Why did he feel it was necessary to mention whilst held in custody the PSNI claimed they knew he had been an agent of MI5 since 1972? It seems an odd thing to say. He must also be the first innocent Irish man to be wrongly arrested and, having spent four nights banged up in a British police cell, to emerge a free man and declare his full support to the very police force who took away his liberty. If he truly believes this it seems to me he misses the point entirely, for what his arrest shows is as far as the British state is concerned the role of the leader of Sinn Féin in the peace process has outlived its usefulness. Thus his arrest was the result of the new guard reverting to old methods. However the arrest of Gerry Adams was undoubtedly a travesty of justice, and the gross hypocrisy of the Irish and British governments, and their creatures within the mainstream media knows no bounds. The UK government did not enter into negotiations with Gerry Adams in the 1980s because he was the tiddly winks champion of Ireland, but because their intelligence services told them he was the most senior and influential member of the PIRA. The British security services have targeted Adams for well over four decades. They hold chapter and verse on his public and private life since he was released from prison in 1972 and included as a 23 year old in the PIRA delegation which held secret talks in a house in Cheyne Walk, West London with the British Home Secretary, William Whitelaw. The delegation included Gerry Adams, Martin McGuinness, Sean Mac Stiofain (Chief of Staff), Daithi O’Conaill, Seamus Twomey, and Ivor Bell. (The latter was once one of Adams’ most trusted comrades, who has also been arrested recently for so called historical crimes.) With Mac Stiofain, O’Conaill, and Twomey all dead, McGuinness is the only member of the sixtet which visited Cheyne Walk all those years ago who has not recently seen the inside of a British police cell. It’s worth noting. Martin McGuiness and a senior party colleague allegedly were so ‘cut up’ about Adams arrest, they joined DUP leader Peter Robinson two days after the arrest of their party leader in the executive box at a Belfast rugby ground to watch Ulster play Leinster. In the 1980s I once watched Gerry Adams shoulder the coffin of yet another dead volunteer and thought to myself how many fallen soldiers can one man bear. After Mairéad Farrell, Sean Savage and Daniel McCann were killed in cold blood by a British army hit squad in 1988 on the streets of Gibraltar, it became clear to all but the most blinkered the long war was lost. All three were well known to the security forces as seasoned volunteers. Their absence from Belfast would have been noticed and an All Points Bulletin posted. The fact they were sent to Gibraltar showed at best recruitment to the IRA was drying up. No, Adams mistake was not negotiating the end of the war, but allowing the British state to set his agenda when negotiating the fine detail of the peace process, and later how Sinn Féin went on to conduct its political campaigns in the north: it was bourgeoisie politics to the core. All radical sharp edges were ironed out and the troops were ordered to keep to the plan which basically boiled down to entering government in both Irish jurisdictions. The fault line running throughout this strategy was the desire for power. Nothing wrong with that, its what politics is about. But when it’s accompanied with little else, it poses the question what is the purpose of this grab for power beyond power itself? Sinn Féin’s annual conference yearly passes resolutions which on the face of it makes the party amongst the most radical within the UK and Ireland. However its record on the ground is far more patchy. Whilst it has a formidable electoral machine which still manages to get the Sinn Féin vote in during local and national elections, those it represents in the working class communities of the north and south have fared less well. According to a new report from the End Child Poverty campaign, West Belfast, the constituency which Mr Adams represented on and off between 1983-2010, has the second highest level of child poverty in the UK. Out of the UK’s 650 parliamentary constituencies, only Manchester Central recorded a higher level of deprivation. The survey found that 43% of children grow up in poverty in West Belfast. In truth that is not a record any MP should be proud of, and many might see it as a mark of shame. Although Adams’ successor as MP, Paul Maskey, has worked hard to bring employment opportunities into west Belfast, they’re within the neo liberal perimeters set by London, which mainly means jobs in the service industries, which are zero hours contracts, low wage, low skilled. What West Belfast needed from its MP was less PR window dressing, and a spot of pork barreling, which provided high income manufacturing, along with government public service contracts which could have lifted the majority above the poverty line. Support for Sinn Féin today while holding up electorally is not what it was, for people need food on the table, a roof over their heads and a future which offers some bright sunny uplands. Jobs now is what they need, not a promise of a 32 county republic at some time in the distant future. Before someone says this is not the fault of Sinn Féin, let alone Mr Adams, I would remind them he has trumpeted the fact Sinn Féin have been in government in the six counties for a good many years, yet beyond the peace process, not an inconsiderable achievement admittedly, what else have they actually achieved? Are their constituents better off economically? Has their been a massive house building program of publicly owned homes for rent, has health care, social services, employment prospects, education services, outstripped the rest of the UK and Ireland? As a party of government Sinn Féin electoral campaigns make light reading. In truth, their years in government in the North have produced a very thin gruel for its core support base. Like New Labour they have produced much fluff and window dressing, and jobs for the anointed ones courtesy of the crown’s exchequer. But a party of government, especially a party of the left, needs to be able to trumpet it’s achievements come election day. But when it comes to Sinn Féin they act as if they have been out of power since 1922. When I saw Adams leaving police custody in a convoy of four by four cars my heart sank. Presumably his destination was a press conference in West Belfast, his old constituency. The Gerry Adams of old would have instinctively understood luxury cars and the second highest level of child poverty in the UK is not a good mix, let alone a bright idea. He also would not have prattled on about his arrest being the work of a small cabal of the PSNI old guard coming as it did in the same week as Theresa Villiers, David Cameron’s Viceroy in the northeast of Ireland, ruled out a review panel to assess the evidence on the Ballymurphy massacre, when members of Parachute Regiment, the same regiment who were later responsible for the Bloody Sunday shootings in Derry, shot dead eleven innocent civilians in Belfast, claiming it would not serve the public interest. Gerry Adams must understand full well Villiers’ statement, and his own arrest, was a public declaration by the British government that former PIRA volunteers must answer for so called historical crimes — but former members of the security forces, police, army and intelligence services who committed or colluded in crimes are to be allowed to walk away scot-free. Guest writer Andrew Sanders writes for TPQ on the need to protect history research. The Boston College Oral History project, often known as the Voices from the Grave project has revolutionised the way we think about the Northern Ireland conflict. In the first instance, it prompted the publication of Blanketmen, Richard O’Rawe’s account of the 1981 hunger strike, a book that changed the way we think about one of the most significant turning points in recent British and Irish history. Some have criticised O’Rawe and claimed he has fabricated parts of the book. I personally believe him, having spoken to him and corroborated parts of his story independently. Corroboration is the essence of good history. A historian who does not seek to corroborate might as well be writing fiction. It is the duty of the historian to gather and interpret information and present it to others in a way that can itself be interpreted by the reader. If we are really honest with ourselves, despite our claims – usually aimed at convincing publishers to accept our work and turn it into a book that we hope will be attractively priced, but very often is not – to the contrary,we are not creating “definitive histories” of anything. It’s arrogant to assume that anyone can create a definitive history. Rather, what we are really doing is adding our angle on an issue in the hope that somewhere down the line it contributes to a fuller understanding of wider, more important things. Ian Wood, my friend and mentor, talks about “adding a brick to the wall” of knowledge. Those of us who have devoted years of our lives to understanding Northern Ireland, be it from the perspective of a Catholic who was burned out of their home in the late 1960s, a Protestant who lost a relative in an IRA bomb attack, a mother who lost her son or daughter to a British soldiers bullet, or someone in Scotland who used to watch news reports of Northern Ireland in the 1980s and wonder how these things could be going on mere miles from his doorstep before revisiting the history of the conflict as part of his undergraduate studies, are all now united in a form of loss. We have lost, in the Boston College tapes and transcripts, a significant resource, something that was sure to offer us unique insight into exactly why certain things happened on this small patch of land in the eastern Atlantic over the course of three decades. It has been taken from us by the actions of malevolent forces. Gerry Adams was never going to be convicted of anything on the basis of a taped conversation between an academic researcher and a former member of the Irish Republican Army. How quickly would any lawyer worth his or her salt establish in the minds of the jury that the evidence came from an unreliable source? Need we cast our minds back to the deaths of Brendan Hughes and Dolours Price and the language that was used in reference to these two people who devoted their lives to a form of Irish Republicanism that has long since been abandoned by Adams? In a perverse way, the demise of the project actually benefits Adams, because the chances are that his political career will be long over before the evidence sees the light of day. It is true that he did spend time in police custody being questioned over his membership of the IRA, but I cannot fathom what the authorities expected to gain from this line of questioning. Meanwhile, we lose sight of the fact that ten children had their recently widowed mother torn from them and were forcibly separated once social services learned of their mother’s disappearance. The injustice cast upon the McConville children rivals that of any other who lost a loved one in the conflict, exacerbated by the continued lies on the part of the IRA about their role in Jean McConville’s abduction, torture and murder and the common knowledge that a senior figure in the West Belfast IRA was responsible for them. So much rhetorical evidence points to Gerry Adams asthe IRA leader who ordered the McConville disappearance and yet it remains unproven. When “Voices from the Grave” was published, it took the momentum of Blanketmen and opened up the operations of the Belfast Brigade of the IRA to the public. Brendan Hughes saw things and did things and knew things that rival the experiences of any other senior republican. We were told he was an alcoholic. An unreliable witness. A liar. David Ervine also featured in that book, although his tale left something to be desired; it ended with the feeling that he had withheld information. With a political party to protect, this was perfectly understandable. Ervine could not have foreseen his early passing and the impact it would have on the Progressive Unionist Party. Aaron Edwards wrote powerfully in the News Letter on Thursday 15 May, questioning the motivations of senior republicans who demand inquiries into events of the past, but only those events that involved the security forces. Behind the hypocrisy of a leadership that can demand justice for one person and speak of “dark forces” behind the quest of another, are the ordinary people who have suffered deeply. The families of the people killed in Ballymurphy following the introduction of Internment without trial in 1971 have seen their quest for truth and justice become the cause celebre of the Sinn Fein leadership, but the use of their campaign as a tool to deflect criticism over the disappeared has been crass. Consequently, those of us who seek inquiries into the events of the past often do so in hope rather than expectation. The cost of the Saville Inquiry was huge and the reluctance of the London government to even entertain any further reviews will undoubtedly leave hundreds without answers. Some politicians claim that these people should just move on. It is a persuasive argument: leave it all behind us and do all we can to better the future for the children of Ireland, north and south, so that they never need to endure the tragedies of the past. But it is also a persuasive argument to those of us who have never lost anyone, who have never had their brother shot dead for attending a protest march, who have never seen their small child blown up whilst shopping for a Mothers’ Day present. At present we are all stuck in limbo. We cannot properly move on, yet we know that we cannot stay where we are. To me, there is a solution. It will not help everyone, but it might help some. We must, together, continue to encourage academic research into Northern Ireland’s past. Again, this was raised by Aaron Edwards in his News Letter opinion article. We can adopt the Historical Timeline Group of the Richard Haass proposals. Indeed, we can take it further. We can petition the government to create more PhD scholarships so that the academics of the present can train the academics of the future and further our collective understanding of why things happened there. Sinn Fein has criticised the Boston College project for only featuring people who are now opposed to the Gerry Adams-led movement and yet it is incredibly difficult for a young researcher to actually talk to those who were in the IRA who remain loyal to Adams. Of course you can get in touch with Sinn Fein, but what is a Sinn Fein representative to say about the conflict? Increasingly, the younger members of Sinn Fein are without ties to the IRA. The answer? We don’t need to talk of amnesty, but rather collectively move past the issue of seeking convictions for killings before 1998, developing the principles of Good Friday, and encourage those involved in the conflict to open up to researchers, carefully managed by the experts in their field, to talk about their experiences, we can still salvage something for the future. We will not get Soldier F opening up and explaining why he thought that the protesters of 30 January 1972 deserved to be shot. We will not get the South Armagh IRA explaining the final moment of the life of Robert Nairac. But we might just get enough so that we can explain to someone why a person thought that planting a bomb in the place that their loved one just happened to be was something they had to do. In many cases, this is all they want. It will not satisfy everyone, but if we continue down the path that we are headed, then the results will be disastrous for us all. I encourage those of you reading who have a past that is tied to the conflict to make yourselves available to the PhD and MA students of Queen’s University and the University of Ulster, indeed any university where someone has decided that Northern Ireland is something that merits their time and focus. Talk to them, be as honest as you like or as honest as you can. Alternatively, find an academic you can trust and talk to them. Ask around, some of your former comrades will be able to vouch for people. If you really don’t want to talk, please record your story. It is important. Write it down, tape it, save it on your computer. Store it with your most trusted friend. Don’t tell anyone about it, hide it from subpoenas. Just make sure it exists and can be made available to people in the future. We can continue to build understanding of the conflict that claimed 3500 lives. We can deepen our understanding of all perspectives – particularly those we are not predisposed to agree with. We will not dismiss them, rather embrace them and seek to establish the bank of knowledge about the past that we all share, in one way or another. We have suffered a blow with the demise of the Boston College archive but it need not hinder our investigations into the past. Andrew Sanders, PhD, is a John Moore Newman Fellow in Diaspora, Conflict and Diplomacy at University College Dublin.